Welcome to the St Peter’s Post, our weekly online newsletter! This week, all classes were busy finishing off their self-assessment folders, their scrapbooks and preparing for the last couple of weeks of the term. With that in mind, the blog was a bit quiet this week, but consider it the calm before the storm – we’ve an exciting two weeks ahead! This week, we launched our 32 County in 24 hours Challenge. Read all about it here! 5th and 6th class visited the Garda station this week and learned lots from our Community Garda Stephen. They also made a podcast about their visit. Listen to it here. 4th class updated us on all their recent adventures – read all about them here. The World Cup kicked off this week. 2nd class put together a great set of links and facts here. Our tennis team from 5th class travelled to Shankill this week – find out how they got on here. We featured in the Bray People and the Wicklow Times this week! 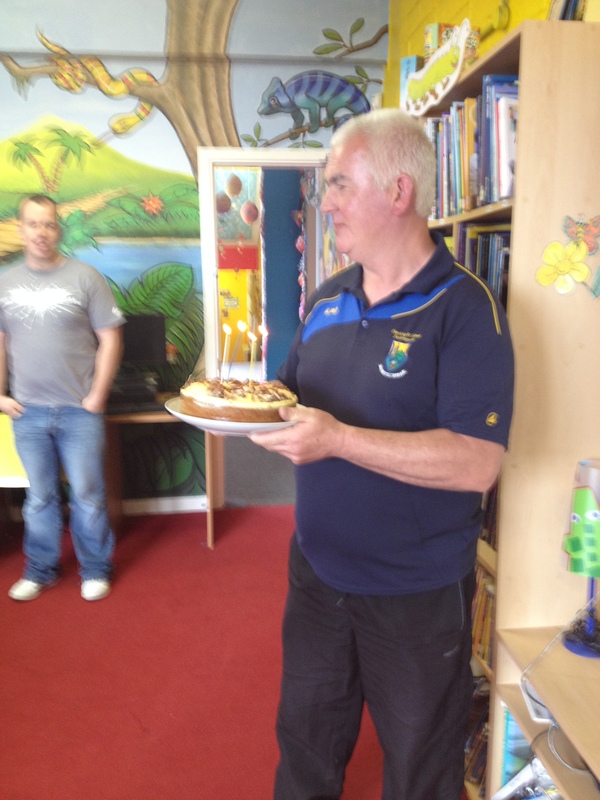 Today (Monday) is Tommy, our Gaelic coach’s birthday! As we knew we wouldn’t see him today, we celebrated it on Friday with cake and lots of singing. We’re really lucky to have Tommy in St Peter’s – he is popular with staff and students for his good humour, great rapport with the students and hilarious jokes! Happy birthday Tommy – thanks for everything you do in St Peter’s! Tommy came in to do hurling training last Monday with all classes – check out our Vine to see how we got on! We’d a very exciting Twitter chat with Alan Nolan, author of the excellent ‘Fintan’s Fifteen’ and he offered to come in and visit us! We featured in this month’s INTO magazine! Mr Kinsella won a set of workbooks from PrimEd Ireland during the week! This is brilliant news for the school as we prepare for next year’s booklists! We were delighted to welcome Anne McMorrough to St Peter’s last week. She visited 2nd class, who Skyped with a school in Tipperary and heard all about their Skype with Chris Hadfield, the astronaut. Anne is from Marino and has interacted with a number of our classes on Twitter in the past. She was really impressed with the work in 2nd class! Six boys went to the Bray Wanderers match with Mr Foley and Paddy on Friday night. The result may not have gone their way, but they really enjoyed their evening! As always, you can find all of our previous St Peter’s Posts here and now, on the website, we’ve included space for the St Peter’s Posts so that visitors to the website can keep up with all of our weekly news. 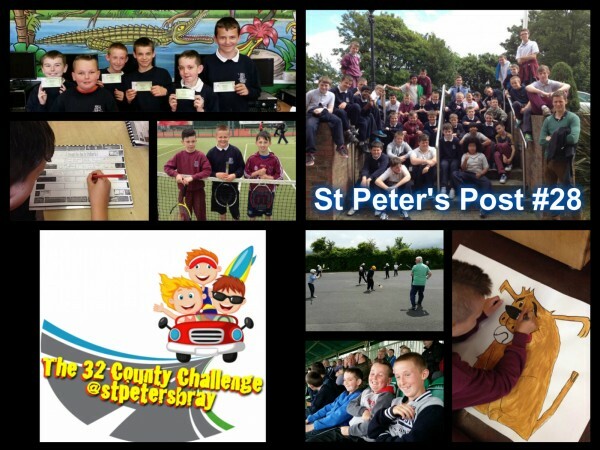 You can access the latest St Peter’s Post at the bottom of the front page of the website or you can click on this link to see them all!